Trusource is a privately-owned Canadian company committed to providing its clients with the best drinking water experience possible. Trusource set up offices in Montreal in 2010 after identifying a need for clean, sustainable and affordable drinking water among Quebec businesses. We tapped into the frustration of businesses that were fed up with the expense, poor sanitation and hassles of using bottled and poorly filtered water dispensers. Since 2010 (time flies! ), Trusource H2O has been serving businesses in the Montreal region with bottle-less point-of-use water dispensers that radically raise the standard of health and wellness due to pure drinking water in the workplace. 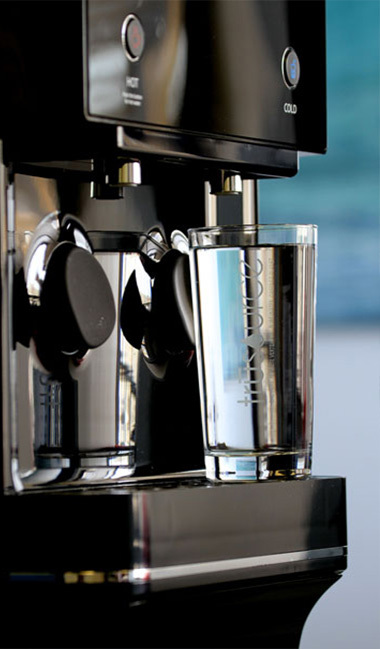 Over the years, we have added different products like a compact counter top model, ice makers and recently, the global gold standard of filtered sparkling water dispensers, the Vivreau systems. As a result of a customer base that grows every day, more than 160,000 people drink Trusource water daily in Montreal, across the province of Quebec, in the Ottawa valley and now in Toronto. We meet the needs of a large range of companies, from small yoga studios, medical clinics, hotels and industrial warehouses to large multi-national corporations. Trusource is proud to provide a green and sustainable solution as an alternative to the heavy carbon footprint produced by most water consumption solutions in the workplace. We are water gurus, committed to our product and dedicated to excellence, professionalism and exceptional service. Every one of us on the team has a story to tell and a reason why we love what we do. By becoming a Trusource client, you can expect friendly service, bottle-less water dispensers and the best-tasting drinking water on the planet.